Losing a family pet is heartbreaking, and nothing is worse than having to deal with that pain on top of the financial burden that often accompanies it. Between final veterinary costs and burial preparations, having to lay your dog to rest can be extremely overwhelming. We all want to do the best for our furry companions, even after their passing. This is your chance to win a FREE burial pod that will allow you to bury your best friend in an eco-friendly and family-friendly way. Making preparations before the time comes is essential for ensuring that your dog gets laid to rest in an appropriate way. If you're hoping to bury your pet on your own property, you need to be sure that it's legal. Some cities and towns don't allow animal burial, even on private property. In order to use an urn or burial pod, you will have to have your pet's remains cremated. While this isn't an affordable option for every pet owner, it may be a necessity if the ground in your region freezes during the winter months or in order to purchase a plot at your local pet cemetery. This will automatically enter you to win this pet burial pod, and we’ll contact you via Facebook if you’re the lucky winner. Don’t wait – the giveaway ends on March 31st! Most urns and pet caskets are made of treated wood, metal or plastic. It takes a long time for these materials to break down once buried, and as they do decompose they release harmful chemicals into the ground. Paw Pods offer the same advantages of other burial pods, but they're also eco-friendly. Made of corn starch, rice husk and bamboo powder, these pods are 100% eco-friendly and will degrade within 3-5 years after burial. The winner of this giveaway will receive a medium-sized Paw Pod measuring 18″ X 12.5″ X 8″. They are able to support 200 pounds of weight, so even the remains of a large breed can be buried in one of these pods. 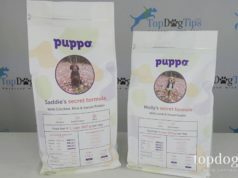 This product is ideal for families coping with the loss of a pet. The unique material that the pod is made from is able to be decorated with paint, markers, glitter glue, and any other art material that your children would like to use. It offers a nice way for children to pay tribute to a pet, and you may even want to write your own message for your canine companion. This Paw Pod also comes with a leaf-shaped piece of material that is seeded with wildflowers. You'll be able to plant this leaf on top of or near the area where you bury the pod and a sweet tribute to your beloved pet will grow year after year. This medium-sized Paw Pod sells for $99.95, and this is your chance to win one for FREE! Don’t forget to follow us on Twitter and Google+ for updates on all of our video reviews, how-to videos, future giveaways and lots of other great information for dog owners. The winner of this giveaway will be drawn on March 31st, 2017. This giveaway is for US residents only. Previous articleTOP #20: What is Holistic Veterinary Medicine for Dogs?